After our three days of wonderful weather in Friesland, we are homeward bound. 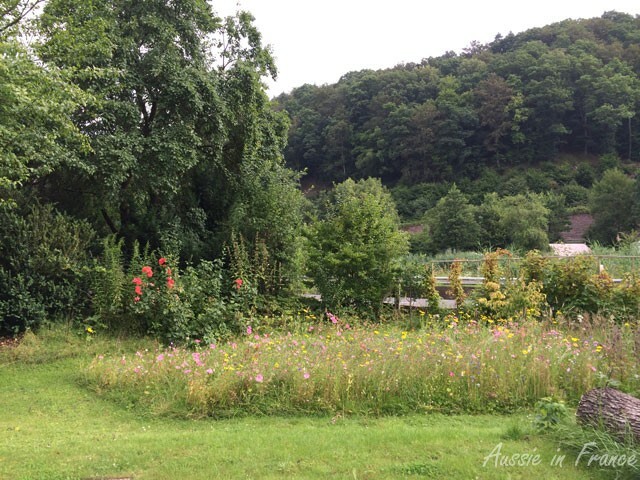 We have 5 nights left in Germany and are spending the last three on the Moselle, near Trier, which is an 8-hour drive, so we are looking for somewhere in the middle where it’s not going to pour with rain. I would like to go to Hamelin (of Pied Piper fame) but it’s a bit out of the way and drizzly. 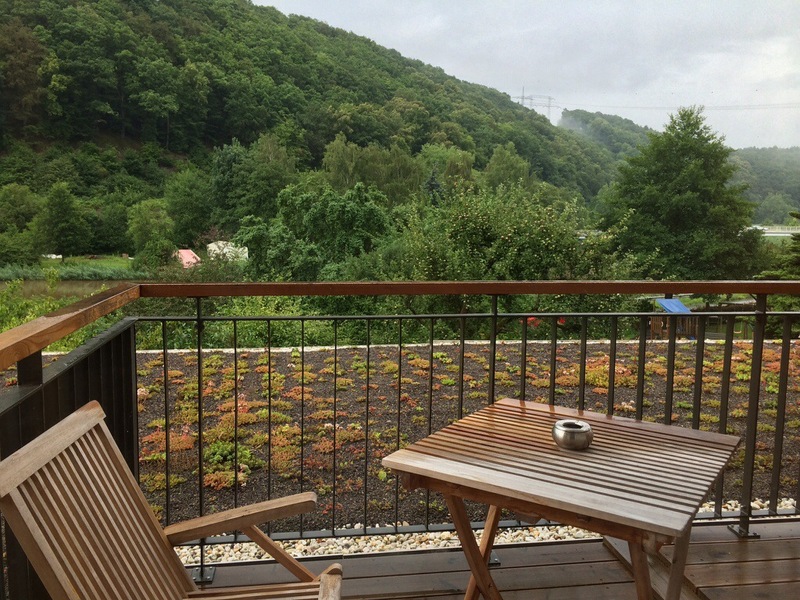 We opt for Hann Münden for which light showers are forecast. 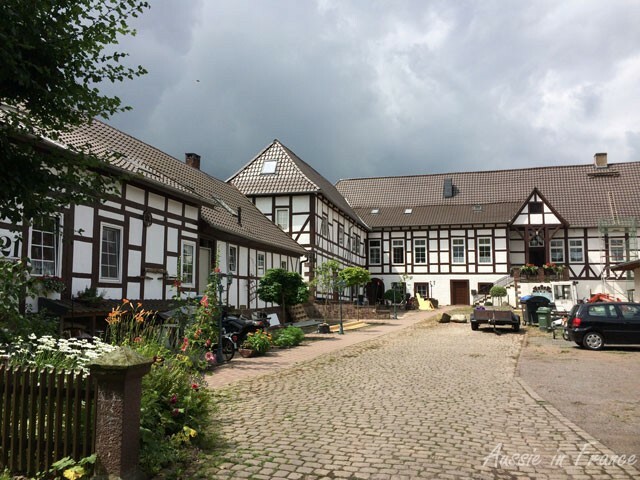 As there is nothing interesting on the way and it’s an intermittent fast day, we have a picnic lunch and arrive at the Werratal Hotel in the rain at 3 pm. We flake out and finally emerge at 6.30 pm. It’s no longer raining so we ask the girl at the desk if she has a map of the bike path to Hann Münden as it’s 6 K from the hotel. She looks so sceptical – after the rain, it will be very muddy – that we change our minds and drive there. 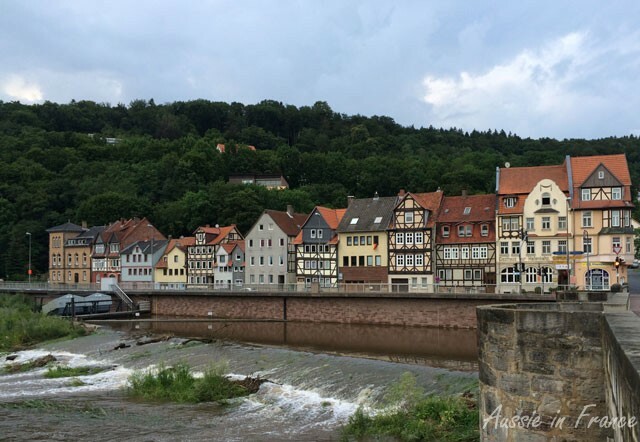 We find a stone picnic table and bench overlooking the town which is at the confluence of the Fulda and Weser Rivers on which Bremen is located. It has another claim to fame. Blois’ most important historical figure, Denis Papin, inventor of the steam engine and pressure cooker, built a steam-pump powered paddlewheel boat, probably pedal-driven, in 1704, and as a demonstration, used his steam paddlewheeler to navigate down the Fulda River from Kassel to Hann. Münden in 1707. 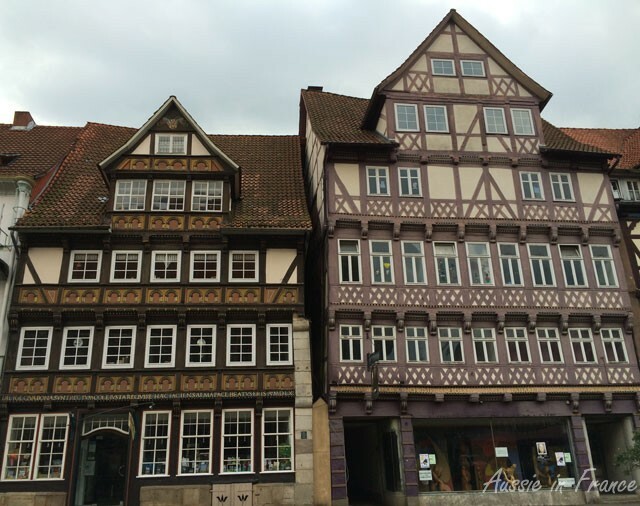 We wander over the covered wooden bridge, typical of those we saw on the Danube last year, and into the town, which has more than 700 historical houses, some of them more than 600 years old, in the Weser Renaissance style. 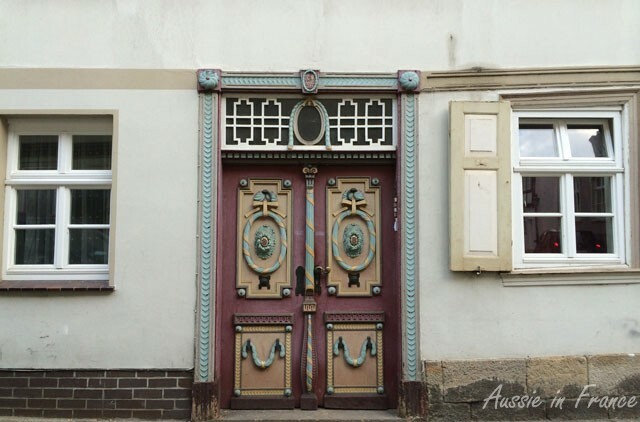 It is not as stunning as Celle, but it is still very charming and there are some beautiful painted doors. It’s next morning and we’ve had an excellent breakfast (good bread for once!). The forecast is scattered showers so we’re taking a chance. We’ve studied the cycling map on the web and decided to start at Bad Karlshafe, which has an interesting history. It was founded in 1699 by French Huguenots fleeing persecution in France. 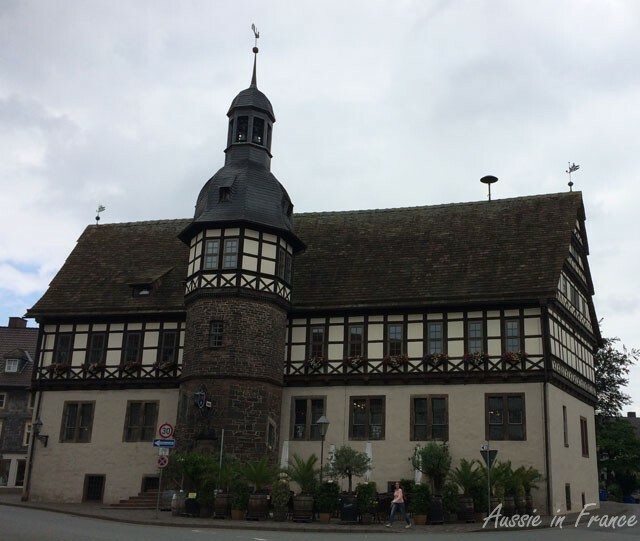 Though initially named Sieburg, the town was later named after Charles I, Landgrave of Hesse-Kassel, who granted them refuge. We find this particularly interesting as the original owners of our house in Blois, Closerie Falaiseau, were Huguenots. The town was built to an ideal plan in the classical Baroque style with a harbour in the centre that is currently undergoing restoration, which unfortunately somewhat detracts from the overall aesthetics. 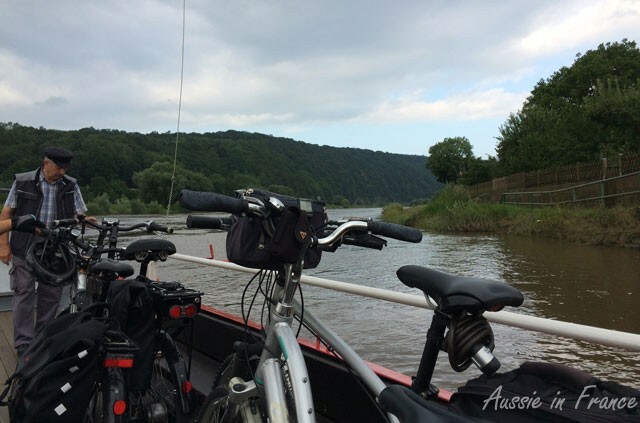 After a false start we find ourselves on a very pleasant bike path along the Weser River. We lament the lack of sun because the scenery is very calm and peaceful, with rolling hills on both sides. It’s nearly midday. 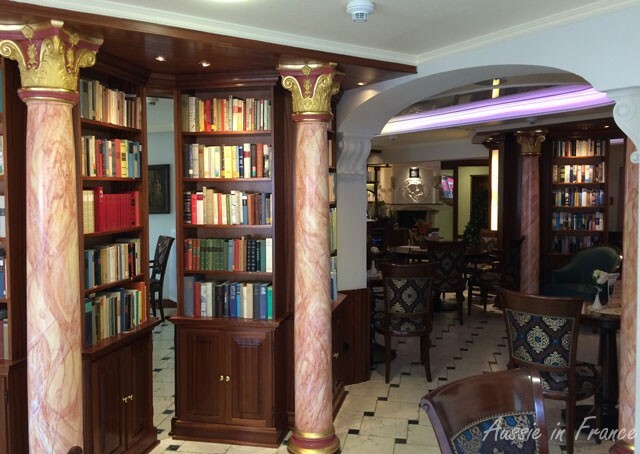 I’m feeling sluggish and needing a coffee fix so when we arrive at Lauenförde which has some lovely old houses with more painted doorways, we stop at the first outdoor café we see, the Dolce Vita Theatre Café. The cappuccino is almost real and the excellent Schwarzwälder Kirschtorte (Black Forest) will keep us going until lunch in Höxter which is still another 20 K.
I go in to use the ladies and discover that the inside is like an antique library. It’s beautiful. Downstairs in the basement, there is a small theatre, hence the name. 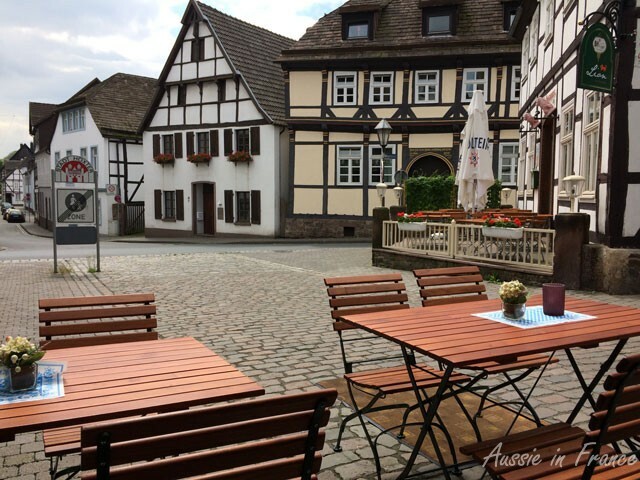 I follow the Ausgang sign and find myself in a small courtyard with a well – we could have sat there instead of facing the street! The path to Höxter is very pleasant and the sun finally comes out. 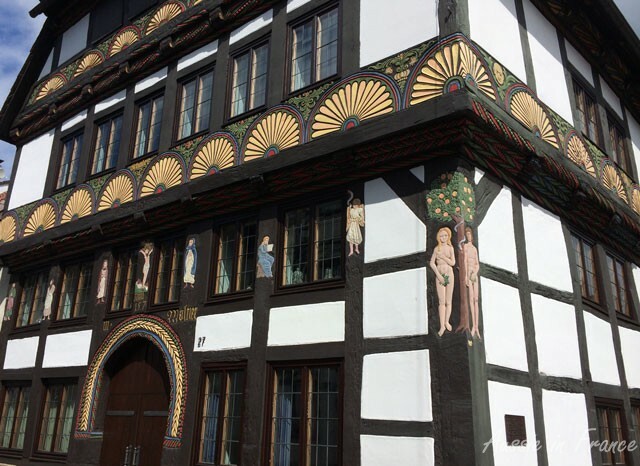 Höxter proves to have more beautiful painted façades, with a different sort of motif. We cycle through the pedestrian centre until we find a restaurant to our liking. By then it’s 2 pm and we are the only people there. Using my German dictionary app, we order roast suckling pig with saukerkraut and dumplings – klein for me and gross for Jean Michel (of course). We are brought a little cup of cucumber and cream soup while we’re waiting. The food is delicious. The bill, including a glass of trocken weiss wein each is 34 euros! I can definitely recommend the Paulaner Wirtshaus on Stummreger Strasse. We call in at the tourist office to get a town map and check we’ve seen all the sights. Ah, we’ve missed Adam & Eve’s house. It turns out to be just down the road from our restaurant and is worth the detour. 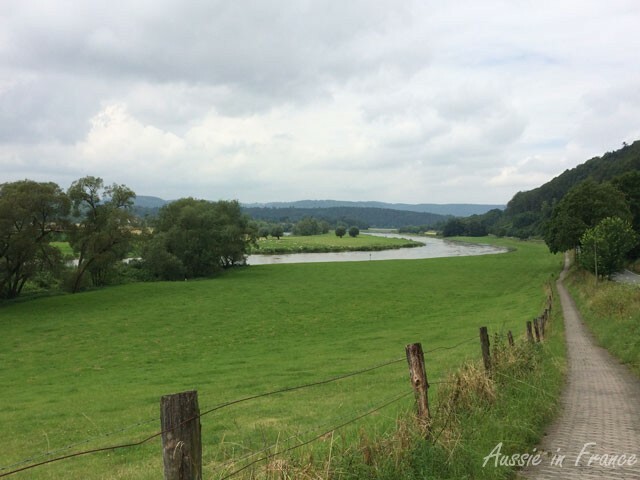 We take the path back on the other side the river and it is just as pretty – and just as hilly! 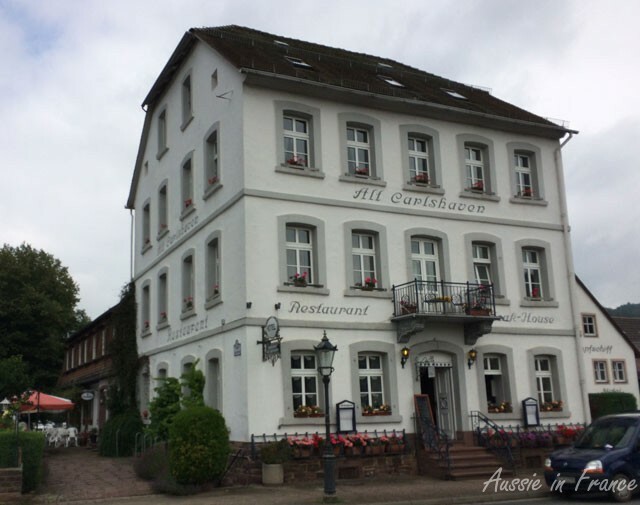 At Wehrden, we visit the grounds of a schloss, a bit worried when we see a privat sign, then have a very cold (and rare) Coke sitting in comfortable chairs with a view of the Weser. At Beverunge, there are more painted façades and an old winch which was no doubt used for a cable ferry. There is also another book tower but not nearly as cute as the red one in Friesland. 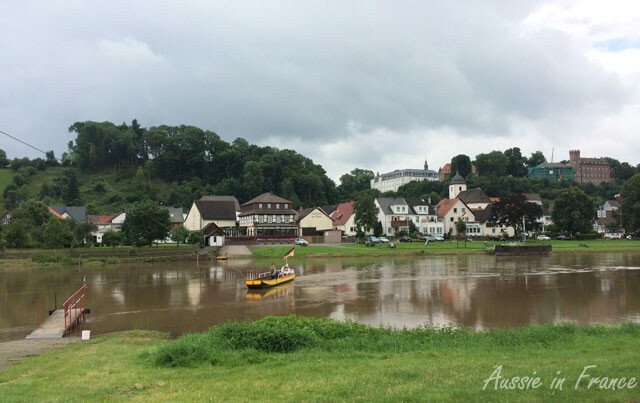 By the time we get to Herstelle, it’s 6.05 pm and we can see the ferry across the river. The sign says the ferry stops at 6 pm but the ferryman waves to us and comes over. Another couple of cyclists are waiting. We’ve never seen a ferry like this one. I’m even wondering how I’ll get my bike on. But the ferryman shows us how to turn the bike and back it into the main part of the ferry. With four bikes and 5 people, we’re almost full. When he sees us taking photos of him, he spontaneously offers to take photos of us. He’s obviously done this before. The ferry costs 1 euro for two people and two bikes. On the other side, a brass band is obviously about to start practising but after waiting around for a while we move on. It’s getting late and we haven’t bought our tomatoes, lettuce and fruit yet for dinner. 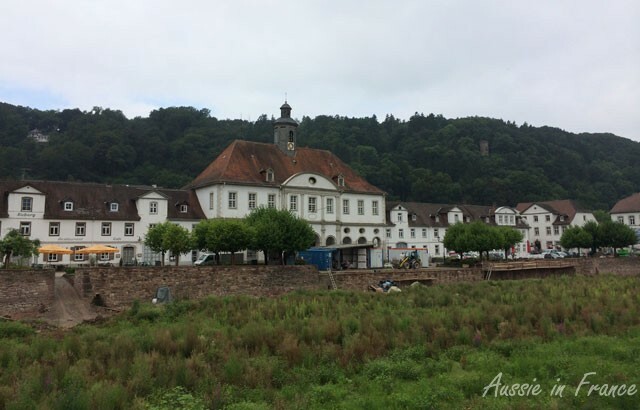 At 7.30 we’re on our balcony with a glass of Riesling and a packet of pistachios, having cycled 54 K and had the sort of day we love – soaking up the scenery, discovering new types of architecture, visiting unusual places – and it didn’t rain! 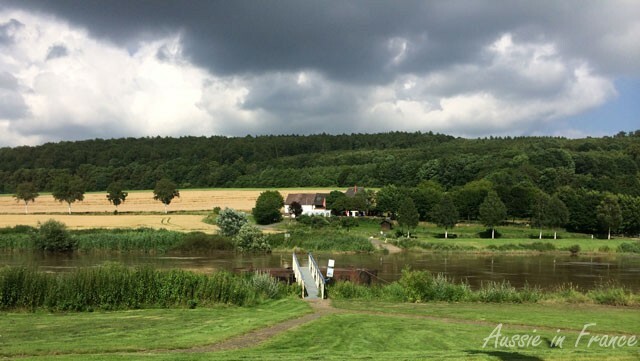 Tomorrow, we’re off to the Moselle and the weather forecast is hot and sunny. 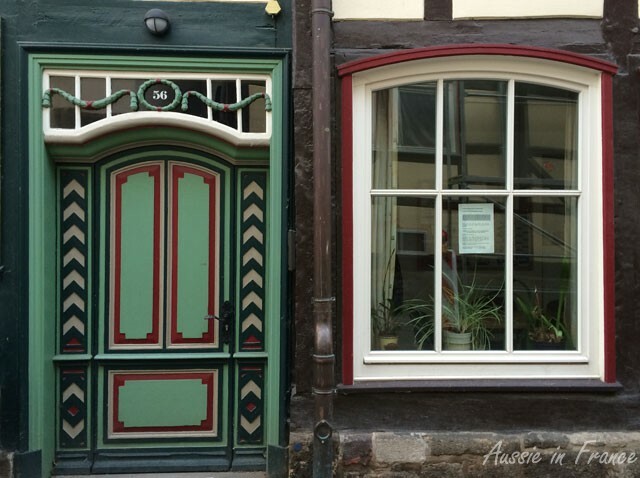 This entry was posted in Architecture, Blois, Cycling, Germany, History and tagged cycling in germany, hann. münden, hoxter, weser river. Bookmark the permalink. 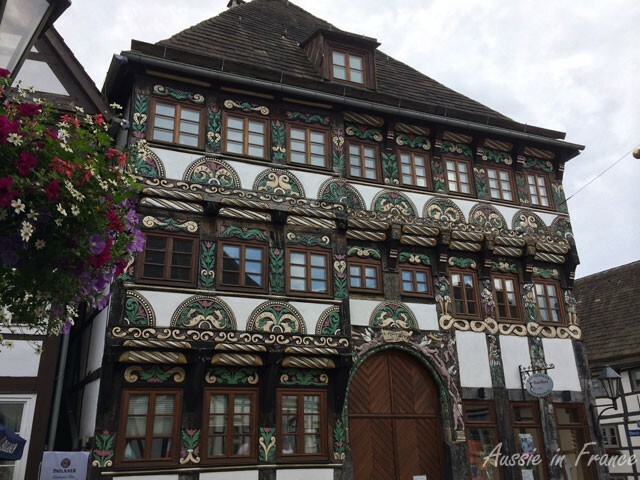 The details of the decor on the walls of these homes and buildings are gorgeous! Beautiful pics. Had the sun been out it would have been blissful! I just love the ferry crossings you take. I was worried when you hadn’t posted for a day or two but am pleased to see you have been busy. Beautful scenery, esp the painted facards. 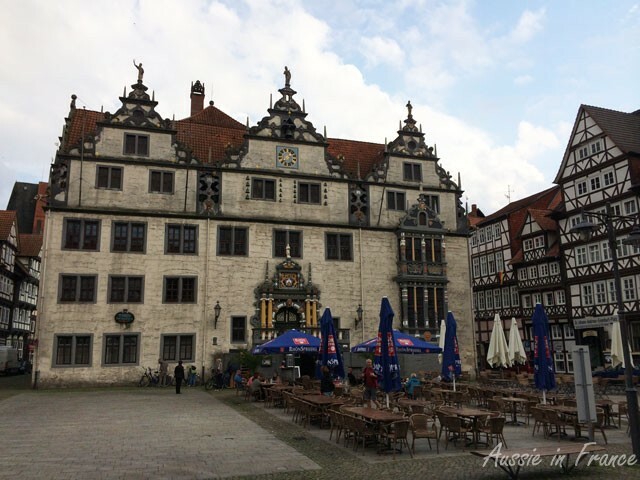 When we were in Germany 2 years ago we too saw lots and admired how they have been preserved. Hope you have sunshine for your final rides. How nice of you to worry about me! Those façades are just so lovely. Beautiful pictures! 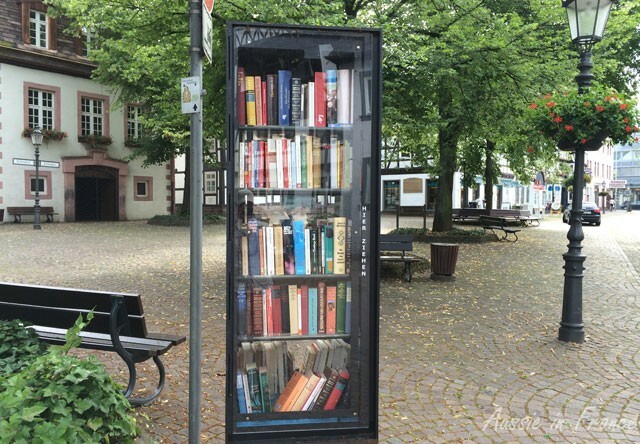 So I have to ask…is that some sort of vending machine for books/mobile library? I’ve never heard of a book tower but it sounds quite intriguing! We don’t know what it is. I have an explanation in German that I am hoping someone will be able to help me with.